This is our favorite section of the website. Here is where we post some of the emails that you send in regards to your own wedding planning process. While we make every effort to answer all of the emails we get, here are our replies to some of the most commonly asked questions. As always you are welcome to submit your questions. If you’re looking for a romantic dream wedding without the headaches and the hassles, a wedding away from home may just be the answer to your prayers. Getting married in a remote destination has literally ‘taken off’ in popularity throughout the nineties, and is destined to be one of the major travel and marrying trends of the new millennium. Getting married abroad is also usually a great deal less expensive than organizing a large wedding at home, and lots of couples prefer to take their vows privately or with a few close friends. 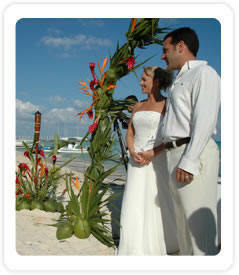 Guests love the fact that they have a perfect excuse to take a mini vacation to attend your wedding. Make sure to check with those you wish to invite to the wedding before you begin making plans, to determine whether the majority would be able to make the trip -- you're not responsible for their travel or accommodation expenses, so it can be a pricey trip for those interested in attending. (Be sure to remind them it's a vacation opportunity for them as well as a wedding!) Send invitations to everyone you'd like to have there on your wedding day -- many may not be able to make it, but they'll appreciate the invite (and they may surprise you and come!). Also, be sure your guests know that they need passports. Then wave them off for their journey home and start your honeymoon!! WHAT ARE THE REQUIREMENTS TO MARRY IN MEXICO? There are two forms of weddings performed in Mexico: THE CIVIL WEDDING (Matrimonio Civil) and the RELIGIOUS/NON-DENOMINATIONAL ceremony. The Civil Ceremony changes your marital status from single to married. Your proof of marriage is recognized as legal throughout the world. A Spanish-speaking Judge performs the civil ceremony. We are with you to translate the ceremony. This can be compared to a ceremony performed by the Justice of the Peace in the United States or Canada. The Judge’s vows are set and cannot be altered. The other ceremony is the Religious/Non-denomination Ceremony. 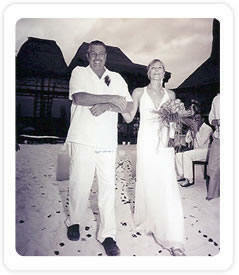 This ceremony does not change your marital status here in Mexico or anywhere in the world. If you want to perform the civil ceremony at your home either before or after your Mexican wedding, you can, or you can do both the civil ceremony and the religious/Non-denominational wedding here. For a Non-Denominational ceremony, you may choose your wedding vows from some of the Minister’s favorites. You may alter or embellish these vows in any way you choose. You may write your own vows or include special poems, readings, songs, etc. If you need ideas or help with any of the words you want to say to each other, your Minister will gladly assist you. DO I NEED TO GET MY MARRIAGE LICENSE IN MY HOMETOWN BEFORE COMING TO CANCUN? No, all the legal paperwork is completed in Mexico. WHEN DO I RECEIVE MY MARRIAGE CERTIFICATE? You receive your completed paperwork immediately after the wedding. My partner and I have been living in the paradise of Playa del Carmen for the past ten years. During our time here, we’ve both realized that our dream is to plan picture-perfect weddings for couples who wish to fulfill their ultimate dream of getting married by a beautiful beach in the Caribbean. Our business philosophy is to provide the highest possible level of service excellence and integrity throughout every step of the wedding planning process. Our personal expectation is to make your dreams come true by creating a wedding experience that will truly be your finest hour. Our past clients continue to sing our praises, letting us know that their experiences were far beyond what they imagined to be possible. By combining superior service and expertise, we’ve fulfilled the dreams of our clients. And we continue to do so…week after week, couple after couple. 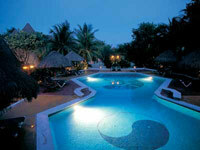 We provide you with personalized attention so you may relax and enjoy this most romantic of times…together. Francesca and Irene. 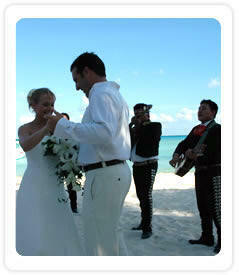 Have yuor wedding in the most beautiful chapel from Cancun to Tulum. 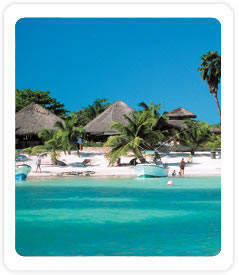 Xcaret: Nature’s sacred paradise.. Weddings in Playa del Carmen can be as different as night and day but for those seeking a beautiful strip of white sand beach..